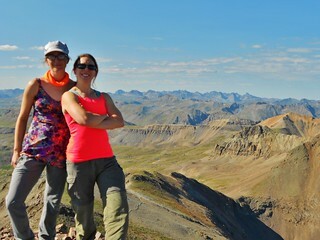 Summit of Ellingwood Point (14,042) after climbing the Southwest Ridge. 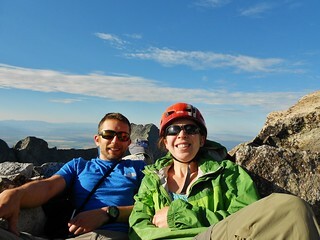 Summit of Blanca Peak (14,345 ft) after traversing the Northwest ridge from Ellingwood Point. Lake Como and the eponymously named “Road”, left of frame. If you’re having trouble seeing the road, because of the boulders, it’s because the road *is* the boulders! For an excellent recap of the Lake Como Road, I entreat you to watch the following awesome video, by Rockfrogs 4WD Club. These guys demonstrate extreme skill maneuvering their tricked out trucks up that road! 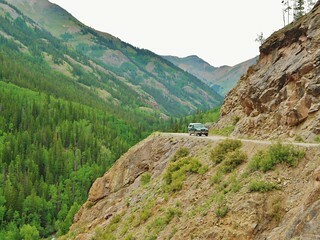 It is one of the most challenging roads in our country, and they manage to get their trucks past Lake Como, all the way up to Blue Lakes. Amazing! On Friday, Doug and I drove from Denver to the Lake Como Trailhead, were delayed by a train for 20 minutes on the way there, hike up the arduous Lake Como Road, scope out the start of the climb, and then set up base camp at Blue Lakes. 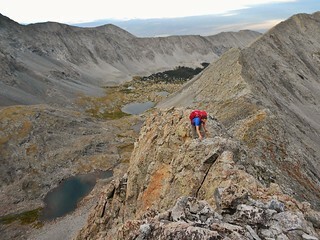 Saturday we tackle the Southwest Ridge of Ellingwood Point, traverse to Blanca Peak along the Northwest Ridge of Blanca, climb Blanca Peak, descend to base camp, pack up, hike back to the truck, and drive back to Denver. It takes us approximately 24 hours to complete our mission, from the time we leave the truck until the time we return. 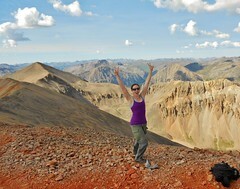 The trip was hectic and frustrating at times; but supremely rewarding and gratifying, as well. 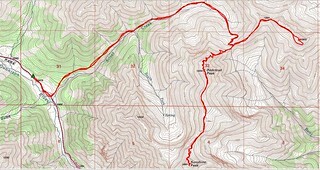 We travelled roughly 15 miles with 6,500 ft of gain. If the Southwest Ridge of Ellingwood Point were more easily accessible, it would be completely plastered with scramblers every day! The rock on this ridge is of high quality and, for the most part, secure. 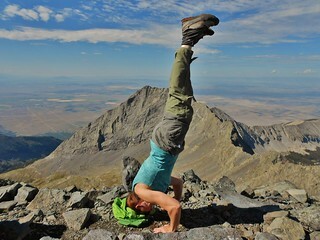 The position of the route and the exposure produces an extremely enjoyable route! Do IT! 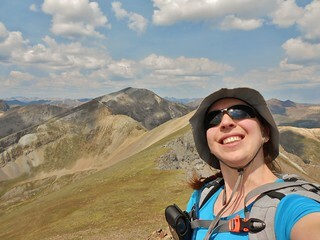 Thank you to skier25, who posted a fabulous trip report, with pictures, of the Ellingwood Point – Southwest Ridge on 14ers.com! Day 3 of SJPBE did not start out very well. It was raining at 4:30am. So we slowly got things ready while it was raining. We were not excited about hiking in the rain. Finally, around 6am, it cleared up a little and became just a slight sprinkle. Good enough! We charged down the road; two girls on a mission. We had no idea how our day would go, we just knew it would be a good day! 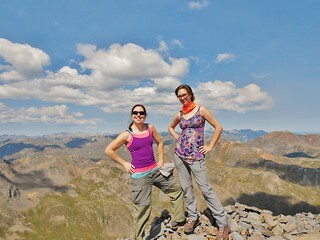 Clare and Erin all fired up on Redcloud! 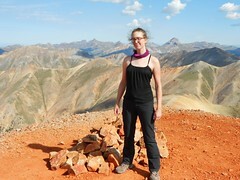 On Summit of Pt. 13,832 (A Centennial) with Sunshine and Redcloud behind me. Elevation Profile showing 15 miles total with 6,300 ft of elevation gain. Whew! 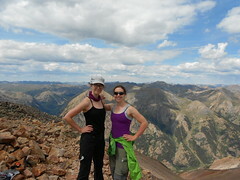 All Smiles on Summit of Jones Mountain (13,860 ft). The Grenadier Mountains are behind us! 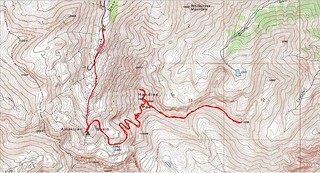 Topo Map, with our approximate route. Elevation Profile, showing our gain of ~2,000 ft with a distance of 4.25 miles. 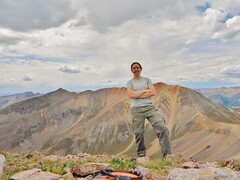 We left high camp at 12,400 ft, hiked to the summit of Jones Peak, and then back to the truck at 11,400 ft.
Then, we moved the truck to the Grizzly Gulch Trailhead to secure our camping spot for that night. As it was a Friday, we wanted to get to Grizzly Gulch before the masses from grasslands arrived. 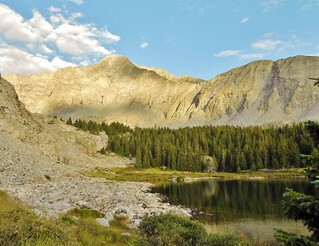 Today our schedule for the day was to climb Handies Peak (I also did the bonus bi-centennial, Pt 13,795) and then set up base camp (somewhere above 12,400 ft) in American Basin. We had a great day and it went exactly as planned. 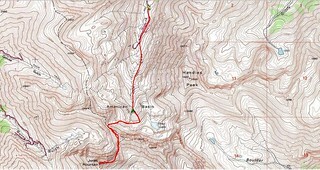 The Topo Map, with our approximate route and camp spot. The Elevation Profile, for Handies and the bonus point, showing 4,900 ft of gain with 9.5 miles. Thus, on a Wednesday, I drove to Erin’s and we filled Bertha with mountaineering gear, coolers, beer, and camp chairs. We were both giddy with excitement; to get the heck out of Denver and into the mountains. You are currently browsing the climbergirl blog blog archives for August, 2013.